Schools: I attended Vunimono Islamic Primary School from class 1-8 from 2007 to 2013. I then attended Nausori High School from form 3-4 and currently I’m a form 5 student at DAV College in Suva. Playing Record: I played in the primary schools Inter-primary in the Under-12 and U14. Then to the Southern Zone in the U15 and 17. Favourite Player: Locally it is Iosefo Verevou because he has amazing footwork skills and the ability to score goals from any distance. Internationally it is Neymar, because he has his own crazy style of football skills and unique style of celebrating after scoring a goal. Best Moment(s): Actually I have two best moments. Firstly when I scored the winning goal for Rewa Youth against Ba in the final last year and being the youngest player scoring a hatrick for Fiji South U17 team against the visiting Australian team in Test match. Worst Moment: When my ankle got twisted against Navua in the U16 friendly match last year. Advice: Always believe in yourself if you want to be a better football player. Always train hard, dedicate and sacrifice your time in playing and always try to learn from your mistakes. Source of Inspiration: My brother Mohammed Raynel who encouraged me to become a professional player and to play football in New Zealand. Most Annoying Player: Ajesh Chand because he always disturbs me whenever I am doing anything. Proudest Moment: When I was selected in the Fiji U17 squad. Aim in Life: To become a better player and play for my country before getting a contract overseas. I come from a family of seven in which I have five brothers. I had interest in football from a very young age as my uncles used to play for Rewa. My dad is not a football player but playing and watching my elder brother brought me into football. 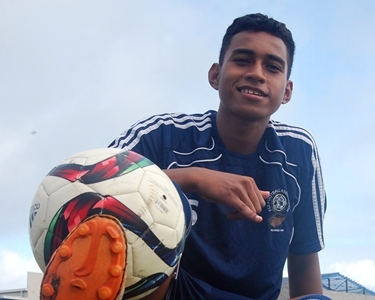 My aim is to play for Fiji in the U17 World Cup and also for Rewa and national team.